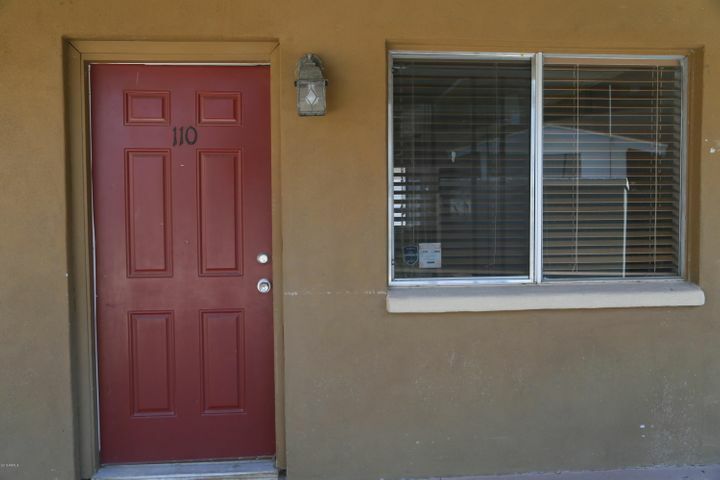 Live in the Midtown Phoenix area, close to everything! Just north of the downtown Phoenix area, lies an extension of downtown along the Central Avenue corridor which I call midtown Phoenix. Home of the world famous Heard Museum, numerous historic districts, and The Phoenix Art Museum. Take in a play at the Art Museum, have dinner at many choices of cafes or famous restaurants, take a walk or fish in Steele Indian School Park, or live in luxury or just the average Joe, maybe even take the light rail to ASU or the airport. Golf, city & mountain views from this luxury high rise. 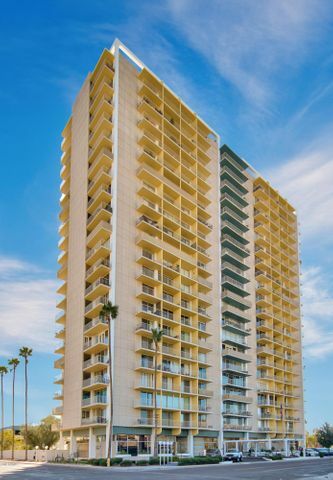 Crystal Point is a high rise building (as a matter of fact the first high rise in Phoenix built as condos) built by McCarthy Construction and completed in 1989, the developer was Lincor. The building has 20 floors and overlooks the Phoenix Country Club on the south side. Some incredible golf, city and mountain views from this building! The original building was built with 63 luxury condominium units, but because people over the years have purchased side by side condos and combined them, there are now 59 condo units in the building. A two month HOA assessment is due at closing for Reserve Fund (non-refundable). Features concierge service, 24 hour security guard, community pool and spa, club room with full kitchen, an exercise facility, and underground gated parking. Executive Towers was the tallest skyscraper in Phoenix at the time of its construction in 1962-63 (22 stories high). It was designed by Alfred Newman Beadle at the age of 33. The 160-apartment building would later convert to condominiums by Moss Development Corporation of Chicago in 1971. The community pool and spa area is dominated by a one-of-a-kind cast concrete umbrella using forms that scoop available light and cast shade. Ruddy volcanic stone was used on the western face of the building. Some great city and distant mountain views. 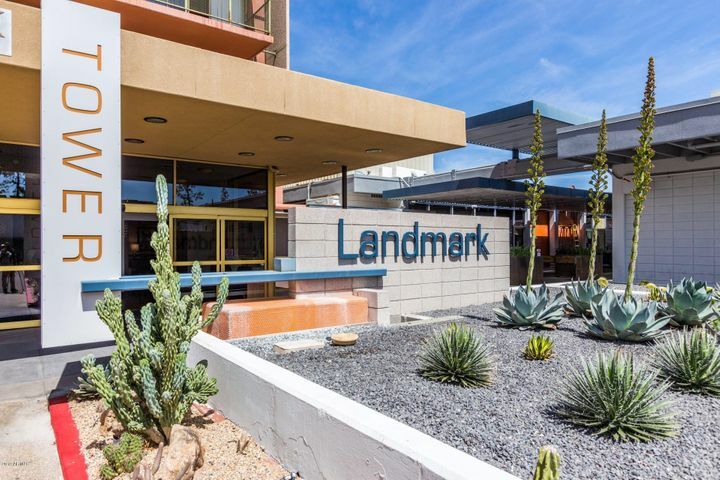 Great location…corner of Camelback and Central located next to a light rail stop and across from a shopping center with a grocery store! Great city and mountain views as well. 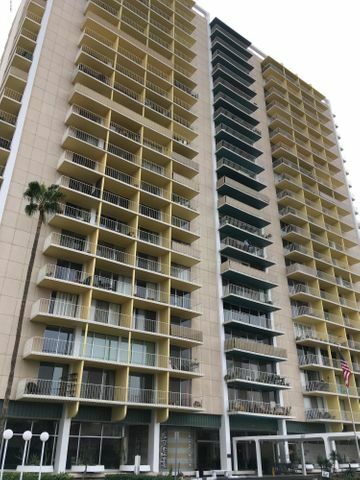 This 17 story high rise building was built in 1963 as Camelback Towers (apartments), and opened in 1964. It was remodeled (not totally) in 2004, and then converted to condos in 2005, and marketed as Landmark on Central. After selling all the units, issues relating to the mechanical condition of the building resulted in complaints in the 2008-2010 time-frame which resulted in some very large increases in HOA assessments for owners at that time in order to fix the issues. Everyone thought the issue was taken care of, but in May 2017 the HOA sent out assessments to all homeowners that averaged $15,000 per unit for Air Conditioning issues. There were two court battles, the board resigned, and the HOA management company resigned. As of early 2018 a new board is working on the issue. Before purchasing in Landmark, make sure to know ALL you can about the health of the HOA and the HVAC system. Community features a gym, an Olympic size swimming pool, rooftop lounge (18th floor Sky Lounge), rooftop billiard room, underground parking, and a resident center with kitchen. A high rise along Central in downtown Phoenix that is located by a light rail station and across from Park Central. Some great city and mountain views! The original developer (Equus) had converted this 17 story office building (original office tower for Century Bank) into 145 condos, and started selling it as Century Plaza. Due to recession, in late 2008 the property went into receivership and a year later the developer filed for bankruptcy. It was not until 2010 that another company (Lexington Ave LLP) purchased the property, renamed it One Lexington, and re-opened the development in April of that year. In the first week, 20 units were sold (at about 50% less than the original sales prices)! Building features workout facility and clubroom, virtual and live concierge service, pool and spa with private cabanas, meeting club room, five high speed elevators, light-rail Osborn Station outside your front door, and assigned covered parking with restricted card access. Phoenix Towers consists of 57 residences, along Central Avenue with over two acres of landscaped grounds. The high rise building was built in 1957 as a resident-owned cooperative community (it is listed on the Department of the Interior’s register of historic buildings). Designed by Chicago architect Ralph C. Harris in the Modern style. Phoenix Towers’ residents park in an underground garage (two side-by-side spaces per apartment). Phoenix Towers completed a $5 million dollar renovation program that included new dual-paned windows, replacement and upgrading of the air conditioning system, refurbishment of the swimming pool and patio, and a totally redesigned penthouse floor consisting of an enclosed community room (with floor to ceiling windows) and a covered terrace. The penthouse floor has a kitchen prep area and offers spectacular city and mountain views in all directions. 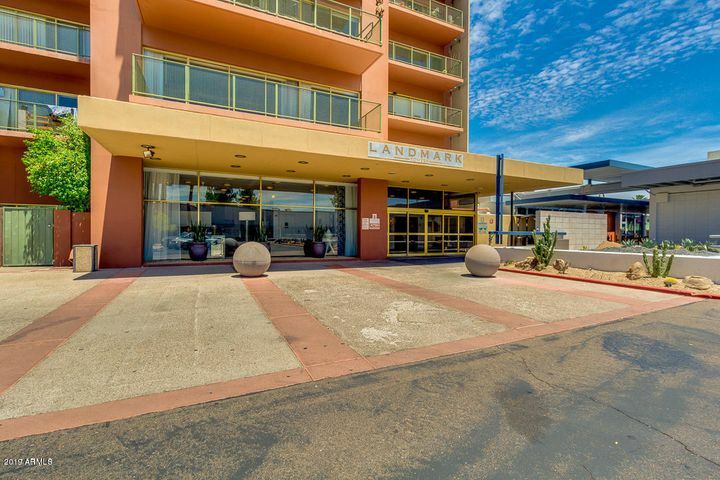 Building features 24/7 doormen service, all utilities, basic cable, and real estate taxes in monthly maintenance, laundry room that is always open (many residences have their own washers & dryers), gym, and swimming pool with kitchen with gas grill. 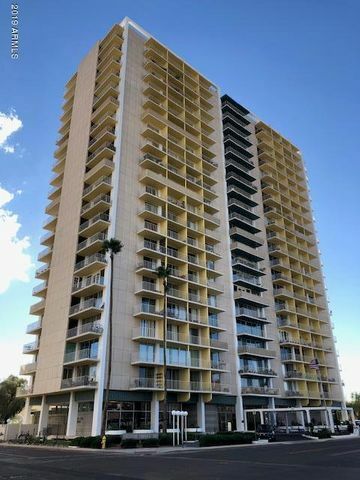 The Regency House was built in 1964, initially as a luxury apartment building; it was one of the first high rise residential buildings constructed in Phoenix. 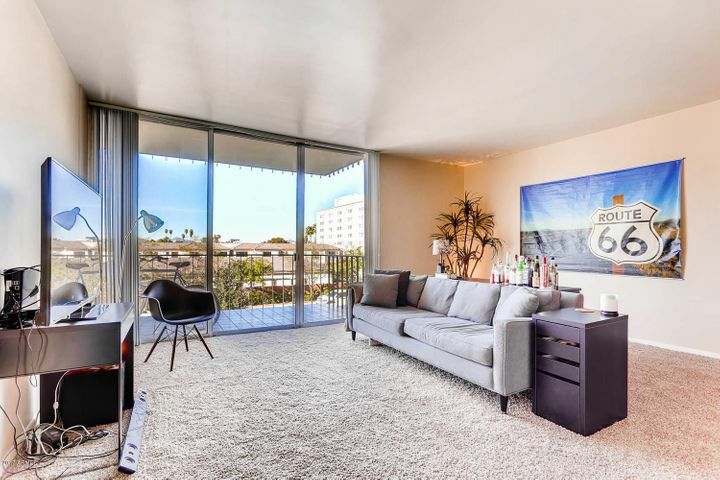 Regency House is a 22-story luxury condominium building located in the heart of the midtown Phoenix Arts District, next to the renowned Heard Museum and right in front of a light rail stop. Spectacular city and mountain views! In 2010 the Regency House embarked on a rebuilding project which resulted in substantial special assessments to owners, some of those are being paid off over a number of years. The status of the assessment pay off should be a question asked when purchasing in this development. The rebuilding project involved repairs to the underground parking garage, replacement of the main heating and cooling mechanical systems, and various other repairs on the grounds. The building has 118 units with balconies, a pool and spa, underground parking, 24/7 security, a social Room with TV, piano, bar and kitchen, fitness center and library. Pets – limit of two dogs or cats. No Rottweiler or Pitbull breeds (or snakes). Located at 1326 N. Central Avenue, the building was built new as lofts with construction started in early 2002 by Artisan Homes. The gated community features homes with dramatic floorplans and large outdoor living areas and is located by the Light Rail line down Central. Building features a 25 yard lap pool, a spa, roof deck with fireplace, BBQ, and views, a dog park, and it was awarded Professional Builder’s 2006 Home of the Year in the Best in American Living Awards. Located across from the Phoenix Country Club, this 5 story building was built new by Artisan homes as “lofts” in 2001. It was among the first of the loft style developments started in the late 1990’s. It originally was designed for 40 units, but several buyers purchased two adjacent units, so ended up with 36 total units. Features a secured entry lobby, fitness room, community pool, BBQ and picnic area, rooftop terrace, and assigned garage parking, two spaces per unit. Units came with scored concrete floors. exposed ductwork, and private balconies. Willetta 9 is a small loft community of 9 loft-style town homes with no partitions dividing spaces and except for bathrooms and the laundry closet there are no doors. Solid-filled concrete block walls divide each unit for sound-proofing. Evergreen 9 is two doors down from Willetta 9, and it is designed by award-winning architect Michael Underhill. It offers open and flexible design with clean lines. Each of the 9 loft homes is 3-levels, with its’ own garage, entrance, and yard. 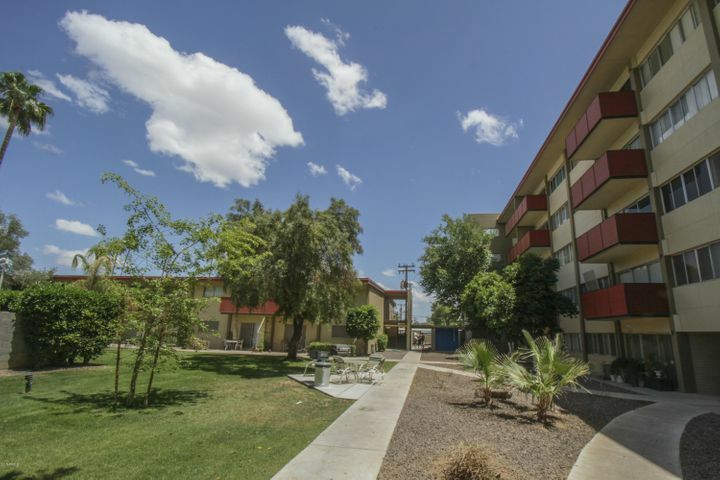 Mitchell Lofts is a seven-unit, loft-style Urban-Living community located just north of the Phoenix Country Club. September, 2010 marked the completion of this community which due to the recession at the time forced the units to revert to the bank, Washington Federal Savings. They since have been sold as bank owned homes at a discount. This gated community is on a private street and has private driveways to each unit and a community picnic and game ramada for social events. A gated modern loft-style condominium development on one of midtowns most eye appealing streets (Palm Lane). Features concrete block, steel and glass construction, the 11 units from 1,499sf to 1,626 sq feet. All 2 story units, 1 bedroom plus loft and 2 baths. 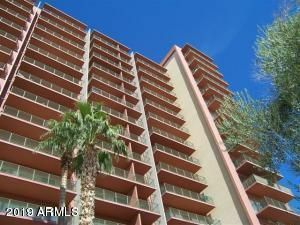 Amazing luxury homes with amazing views right in downtown Phoenix, five floors and your own elevator! Work started on this luxury townhome project in 2005, but developers (Central Phoenix Partners) ran into trouble and in 2007 filed for Chapter 11. Construction stalled until Mortgages Ltd provided financing; but in 2008 Mortgages Ltd was forced into bankruptcy and the project was again stalled. In 2010 MSI West purchased the development and finally completed it. By 2018 there were still some unsold units, the prices were dropped and the complex renamed to The Arris. Six floor plans were offered ranging from 5,192 to 8,252 square feet, total of 21 units, each town home is five stories tall with its own elevator and roof-top terrace (which is stressed for addition of small pool or spa). No interior load bearing walls except for elevator shaft (so interior walls can be moved). Each unit has commercial zoning for first two floors (end unit on Central has commercial zoning for first three floors). A collection of 20 homes developed by SRM Development, with Riley | Smith Development doing construction. All homes are 3 levels with garage on ground floor, two floorplans offered, 1,731 and 2,150 sq feet. The community features a pool and spa, a BBQ area, and a dog walk. Community had only a few homes remaining first part of 2018. Built in the Roosevelt Historic District, 10 new duplex-style homes with the same floorplan were built by Schultz Family Homes in 2000. 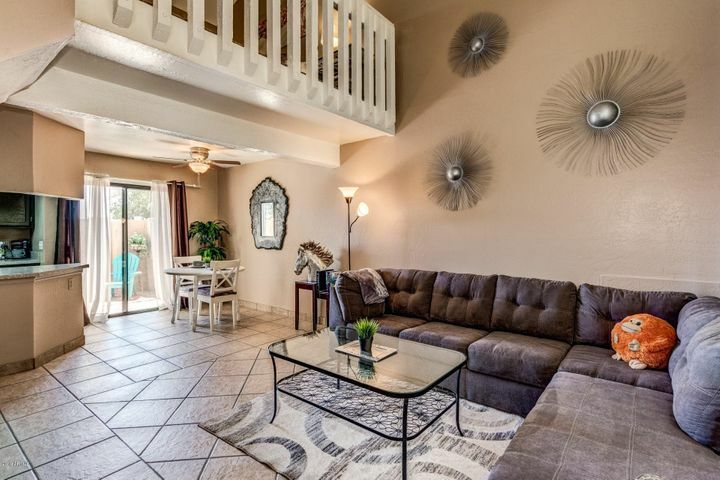 A small townhome community of only 7 units in the Phoenix Country Club. Built by Del Trailor between 1965 and 1966 in a gated community surrounded by larger more expensive single family homes in the country club. Uptown Row is made up of 10 modern, row-style townhomes located right in the heart of North Central Phoenix just off 7th Avenue and Camelback in the Pierson Place Historic District. Each of the three-story residences features 2 or 3-bedroom floor plans, 2.5 baths, 2-car garage, and range from 1,651-2,057 square feet. The project broke ground in mid 2015. Features concrete and wood-tiled floors, stainless steel appliances, 10′ ceilings, a private courtyard and rooftop terrace for each unit. Boxwell Southwest was the homebuilder. Developer converted an existing 1999 apartment complex into condos starting in 2005. There are 155 total units in the development. The developer sold 81 units before the 2008/2009 recession. Another entity (ST Residential) came in and rented the 74 unsold in 2011/2012. This gated community features a clubhouse with fireplace, pool with gazebo and BBQ’s, spa, and fitness center. Built by Charlevoix Homes in 2004 to 2006 time period. 107 total units in three buildings, each four stories high. The development is located next to a school (west side). This gated community features a clubhouse with fitness center, social area with kitchen, fireplace ,and large screen TV, and a community pool and spa. artHAUS is a collection of twenty-five urban dwellings located in Midtown Phoenix, the project broke ground in 2015 and is expecting the first move-in in May 2016. The homes are organized around inter-connected semi-private resident courtyards. Dwellings consist of seven three-level townhomes, fifteen two-level lofts, and three single-level flats ranging from 560 to 1800 square feet. Brick Commons started life as the 195 unit Acappella Apartments in early 1999 (SNK Realty Group owners). In March 2006 Mentor Properties purchased the complex for $26.4 million and Belleview Communities/Brick Lofts LLLP converted them to condos, spending an estimated $4 million dollars over an eighteen month period. The complex covers 6.6 acres. Four models were offered between 760 and 1,217 sq feet. Carport included, but the garage was extra. This gated community features a renovated clubhouse including a new movie room, fitness center, billiards, kitchen, business center, and lounge, and a pool with covered veranda and misters. Originally built as a luxury apartment complex named Legacy on Camelback. The development started construction in late 2000 to build the 360 units on the 12.25 acre site with construction completed in 2002. The name changed to Reflections on Camelback a few years later and then was converted into condos in 2006 with another name change. In 2009, Orion Camelback (AHC Metro City LLC) purchased 185 unsold units (due to the 2008/2009 recession) and is renting them. The remaining 175 units are individually owned in the development. This gated community features a fitness center, a community pool with outdoor fireplace and kitchen, spa, a billiards room, clubhouse with wireless internet, and a business center. Devonshire Square was converted in 2006 from apartments that were built in 1983. The original 26 apartments became 24 condo units. The gated development is comprised of four buildings around a community courtyard with a fountain. The developer stated the units were “totally rebuilt”. Deco Communities broke ground on this seven story condo building in late 2015, it features 110 condo units in a five story building on top of two stories of above grade parking. The project is located on 1.2 acres and is expecting its first move-ins in late 2018/early 2019. As of May 2017 they had started framing the 6th floor, and its scheduled to open in 2018. It is located across from a light rail station along Central Avenue in midtown Phoenix. This development features a 2,000sf fitness club, bike room with repair station and secured storage, outdoor yoga area, 60′ lap lane in pool, outdoor kitchen and dining area with full BBQ, pool and spa, fire pit and seating area, gated parking garage, car wash bay, and pet wash station. Evans Withycombe converted an existing apartment complex into condos in 2005-2006 timeframe. 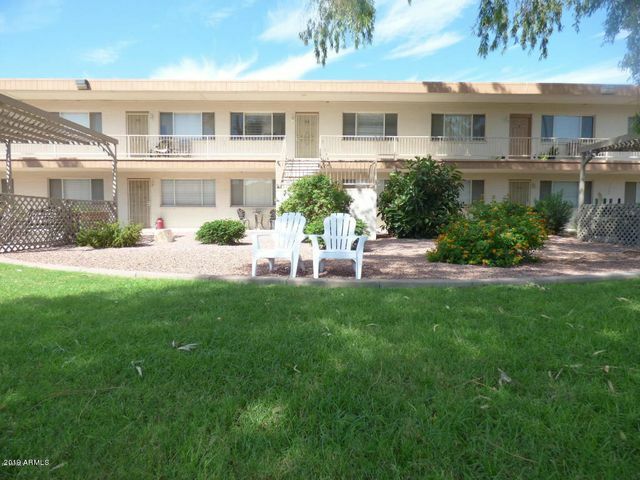 The builder at that time repainted the exterior of the complex, added new pool furniture, and added new landscaping. There are 276 total units in the development (182 units sold to Canadian investor, Hawthorne Phoenix Condos LLC in 2009). 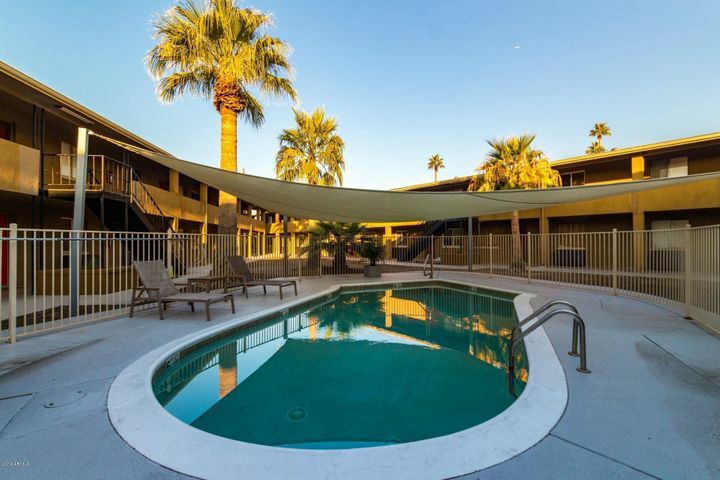 This gated community features 2 pools (one heated), barbeque grills, a 24 hour fitness center, resident clubhouse, ramada picnic areas, 2 spas, and a resident business center. 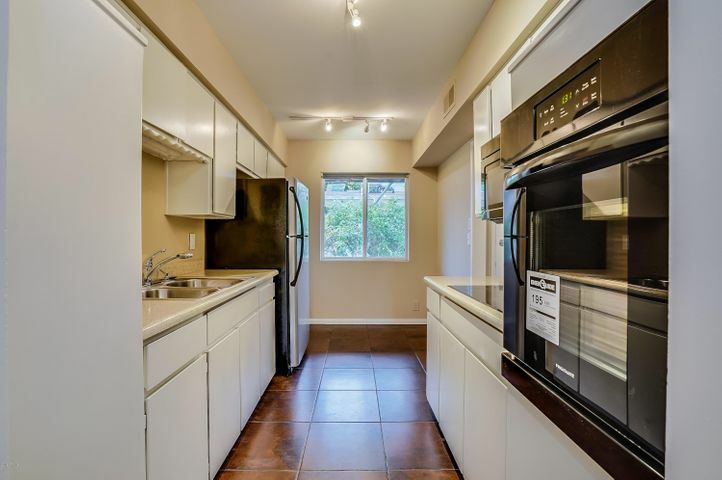 A condo community built in 1985 with 32 units with an average size of 1,060 sq feet each. Community has underground secure gated parking, pool, spa ,and a koi pond with gazebo. Located in the Melrose area. The original 1961 Pierre Apartments sitting on just under an acre of land was converted into condos in 2007 by Pierreon 5th LLC. The 25 condo units in this 3 story building are set around a courtyard pool. Each unit has a patio or balcony and gated parking. 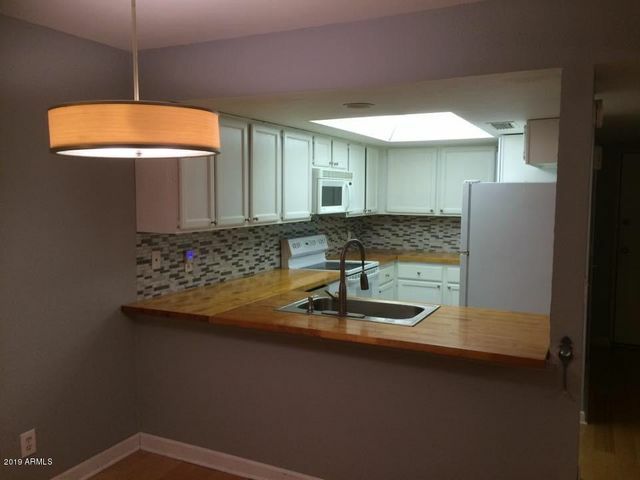 A 32 unit "garden apartment" condo complex that has the mid-century vibe! Built in 1962, and a condo plat that was recorded in 1979. There were four floorplans offered, the average size is 1,288 sq. feet. The community features a pool and spa. In 2006 a 1986 built apartment complex (Esplanade Apartments) was converted to Solaris condos. The complex sits on 4.5 acres and contains 132 condo homes. The sales materials called it “upscale living” in a downtown style. This gated community features a community pool and spa, a fitness center, billiards room and clubhouse. Built by Solterra Condos’s LLC in 2006. Of the total 60 condominium units, 20 were sold before the 2008/2009 recession. The developer was renting the other 40 unsold units. This gated community features a community pool and "Romeo & Juliet" balconies. Great location….on Central across from Heard Museum and at a light rain station! Originally this development started life as “WilloWalk”, and was being built by United Properties (of Canada). The developer had financial problems and construction stopped 2002/2003. In 2003 GDC Development and Starpointe Communities purchased the property and in 2004 work restarted on the development. Development includes 280 condominium units (flats, “view lofts” and two-level “penthouse” style units) and 12 commercial parcels. You can walk out and catch a train in front of your building! This community features a 4000 square foot clubhouse with theatre, lap pool and spa, fitness center with sauna and restrooms, and underground gated and assigned parking. In 1959/1960, Windsor Place was built as an upscale apartment community for visiting guests of the Phoenix Country Club. It was called Frontier Gardens. In 1983, a California corporation known as Coam purchased the community and renovated the homes. Coam then sold them individually, as 167 privately owned condominiums in five buildings. This gated community features two pools and laundry. The HOA fees cover water, electric, heating and air conditioning. Service animals only.